While Apple touted the power of the new A8X chip used in the iPad Air 2 at the company's media event last week, the company as usual opted not to disclose exact specifications on the part, leaving the details up to rumor and speculation until the device starts making its way into the hands of users and teardown experts. 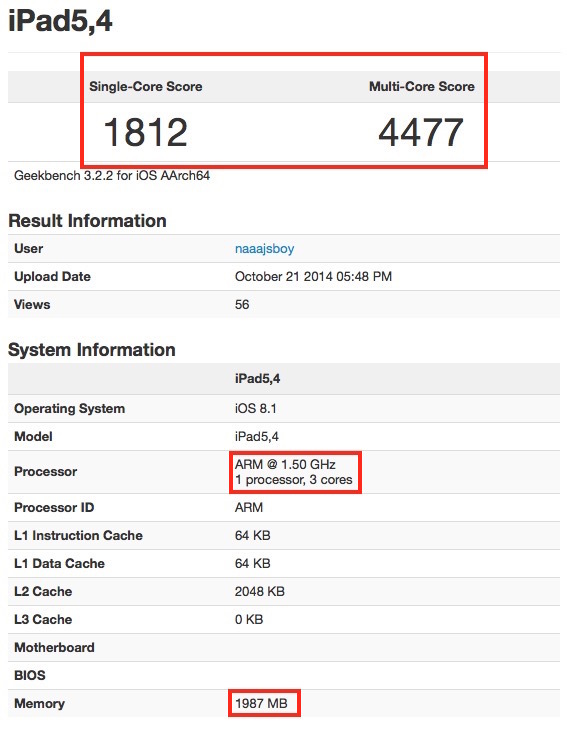 But with Apple shipping out orders to customers for delivery as soon as tomorrow, it appears that at least one user has already gotten his or her hands on the iPad Air 2 and run a Geekbench 3 benchmarking test on it (via Gizmobic). If the result is genuine, and Primate Labs founder John Poole tells MacRumors that it appears to be, it reveals that the A8X contains an unusual triple-core CPU configuration running at 1.5 GHz and paired with 2 GB of RAM. The extra core and 100 MHz faster clock speed compared to the A8 found in the iPhone 6 and 6 Plus means the iPad Air 2 scores roughly 13 percent higher on single-core benchmarks and 55 percent higher on multi-core benchmarks than Apple's latest iPhones. More details will undoubtedly be unveiled in the coming days as teardown experts take the iPad Air 2 apart and chip experts examine the internal layout of the chip. That's better than the new Mac Mini. So it has 2 GB of RAM. Now what will the primary gripe be? Only 2GB?, wake me up when it has 4GB. "Safari won't keep my 20 tabs up without them refreshing!" That the base storage config is still only 16GB and it should be at least 32 or 64GB. Well, I guess it has 2GB of RAM.